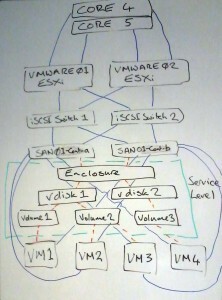 As you may or may not be able to see from this diagram the Virtual Machines which we are running have both controllers for the SAN defined as parents in the topology. However, as we do not have Datastore HA licensed in our VMware Cluster, the VM is dependant upon the status of the SAN Volume which holds its files. What I wanted to be able to do is to monitor the status of an individual volume or vdisk on the SAN. This will then allow me to set up service dependencies between the VM host and the volume service check in Nagios, as well as having the VM hosts parents’ defined as the SAN controller hosts. I felt that this was going to be the best representation of the actual environment in our Nagios system. So to be able to do this I needed to edit Thomas’ script further. You can see my edited version over here on Paste Bin and hopefully Thomas will include these changes into his version too. This introduces two new commands to the script, “named-volume” and “named-vdisk” if using either of these commands you must also pass a -n variable to the script which needs to contain the name of the volume or vdisk as defined in your P2000. The script then access the web API and retieves the XML return for the status of the volume or vdisk. If the health return of this is anything other than “OK”, the script will return the reason and recommendation to you in the output to Nagios. I feel that for status monitoring of our SAN this is more than adequate; in time I will probably look at performance monitoring too, at which point I can look into that side of this fantastic little script that Thomas has provided. 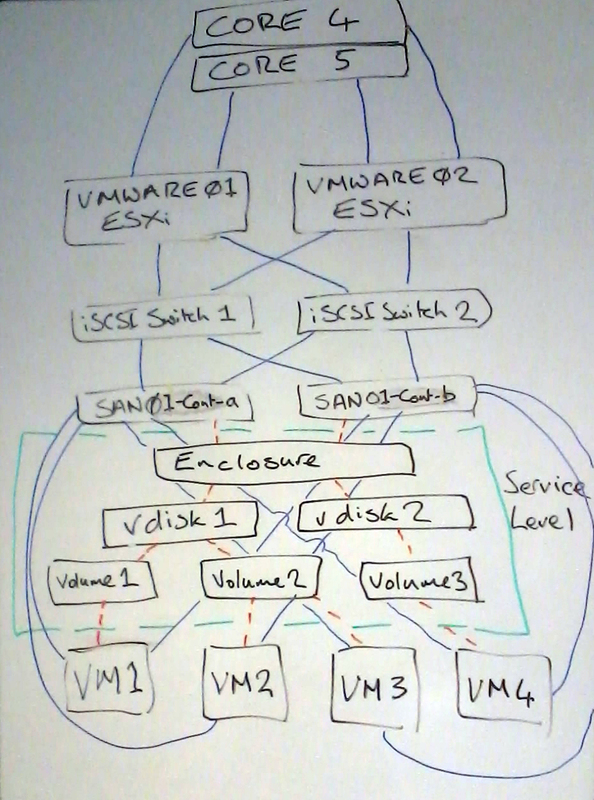 The next part to get monitored fully is the iSCSI switches, then on to the ESXi hosts; but more on those parts in another entry!